The Ursuline Sisters of Louisville are a congregation of women religious in the Roman Catholic Church who follow a life of consecration andprayer united with good works. Teaching Christian living is our corporate ministry, which, cutting across socio-economic, racial and national boundaries, assists women, men and children to live more fully and to develop a personal relationship with God. 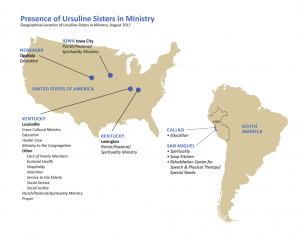 The Ursuline Sisters of Louisville have a rich history that dates back to 1858 in Louisville, Ky. Today, we minister in 3 states (Kentucky, Iowa and Nebraska) and in Peru. Click on the map below to enlarge. The Ursuline Sisters of Louisville, Kentucky, an apostolic religious congregation of the Roman Catholic Church, rooted in the spirit and tradition of St. Angela Merici, are committed to a life of prayer and community and participation in the teaching mission of the Church. This symbol is worn only by Ursuline Sisters of Louisville either on a chain or as a lapel pin. Created by the late Sister Brigid Kirn, OSU and selected by the sisters from among 16 potential designs, it was adopted in January 1976 to replace the habit (regulation dress for the sisters). The cross was chosen as the basic structure because it is a universally recognized sign of Jesus Christ. The flames, signifying consuming love, are the work of the late Sister Benedicta O’Connor, OSU. The words, Soli Deo Gloria are translated by the Louisville Ursuline Sisters as “Be glory to the only God.” These words may be traced back to 1776 as the motto of Ursuline Sisters. 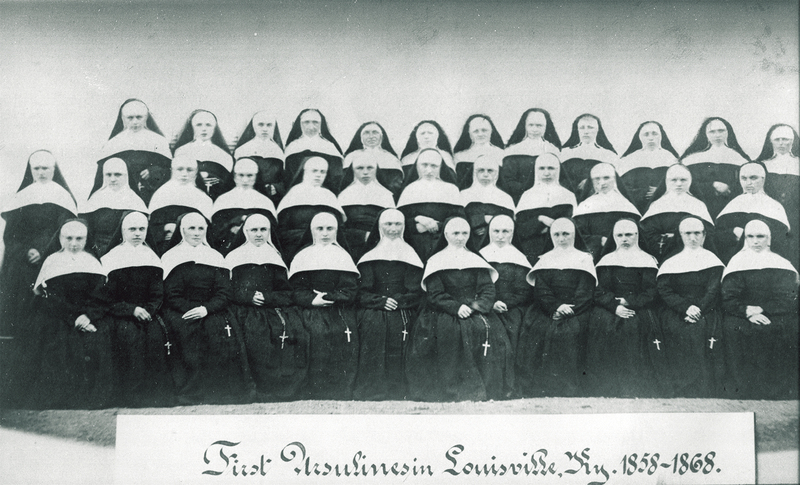 The Ursuline Sisters began their ministry in Kentucky in 1858 when three sisters from Germany, led by Mother Salesia Reitmeier, answered a call to teach at St. Martin School in Louisville. Within two weeks of their arrival, the sisters were teaching 50 students with plans for constructing a convent and boarding/day school on Chestnut Street near Shelby. 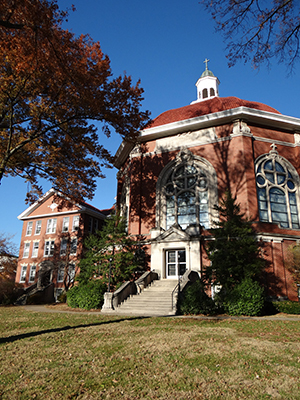 The building was completed in 1859 and was named Ursuline Academy. The new school for girls offered classes from elementary through the twelfth grade. Soon the Ursuline Sisters were asked to operate and staff other schools. They established Sacred Heart Academy in 1877 on Workhouse Road (now Lexington Road) and by 1881, 20 schools were in the care of the growing community of 108 sisters. 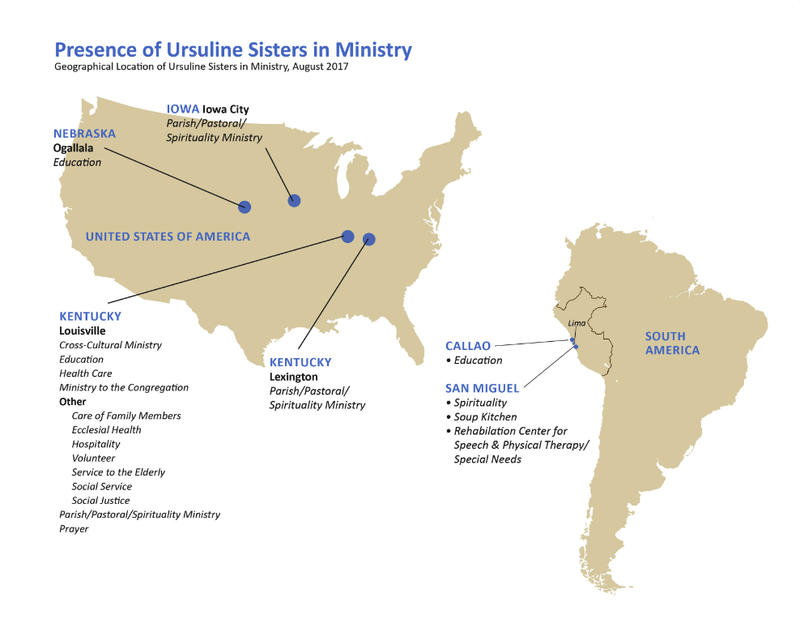 In addition to schools in Kentucky; since 1858 the Ursulines have also served in 23 other states and Peru, South America. In 1917, the sisters completed construction of their new Motherhouse on what was to become the Ursuline Campus on Lexington Road. By the late 1950s, the Ursuline Sisters had staffed or were staffing 23 parochial schools in the Louisville area, as well as schools in other states. They owned and operated in Louisville Ursuline College, Ursuline Academy, Sacred Heart Academy, Sacred Heart Model School, Angela Merici High School, and the Ursuline Speech Clinic. When Vatican Council II (1963-65) issued its challenge of renewal, the Ursulines responded promptly, involving all the sisters in the renewal effort. The challenge resulted in revitalized prayer, diversified community living, restructured government, greater community participation and new forms of teaching Christian living. The Ursulines now experience living closer to the form of life established by Saint Angela Merici in 1535. 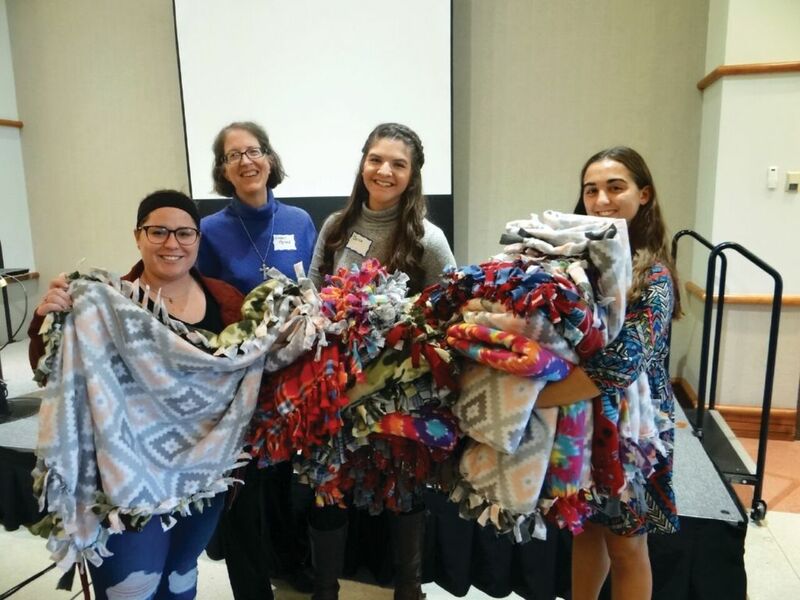 Today’s ministries and interests reflect the rich diversity and legacy of service as put forth by the Ursuline foundress, Saint Angela Merici.They include social services, education, healthcare, parish/pastoral/spirituality/cross cultural ministries, presence and prayer.